This handheld stabilizer works so well that it allows you to shoot incredibly smooth and graceful shots even while going to extremes like running up and down stairs. This amazing stabilization system will provide professional results previously out of reach for low budget video and filmmakers. 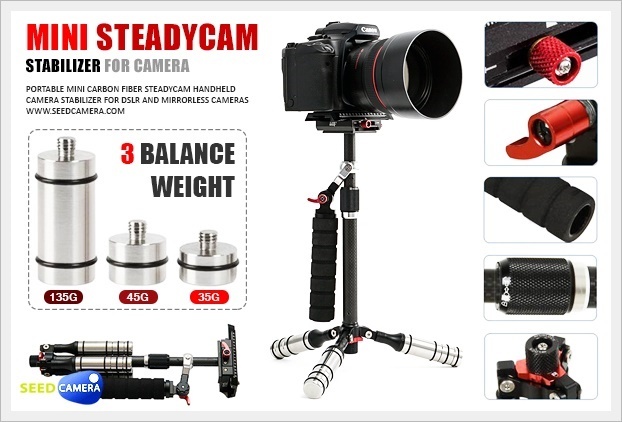 It is a mini stabilizer that can accommodate from amateur to professional and a wide range of users. It is quick and easy to set up and balance. Its made of durable aluminum alloy and carbon fiber. Its soft sponge on the hand grip makes you feel comfortable when handle it. And it fits for DSLRcameras,compact cameras and DVs. 1. Lightweight, compact and heavy loading up to 3 Kg. 3. Quick release plate with scales can record dynamic balance for different equipments. 4. Quick Release plate can move front and back, left and right, and with anti-slip pad to protect your camera effectively. 5. Extend quickly for shooting at a higher angle. 6. High precision bearing and low friction joints. 7. Super smooth gimbals, accurate motion. 8. Soft sponge on hand grip, make you feel more comfortable. 9. Three detachable high precision counterweights with different sizes, enhance the stability and balance, you can adjust the quantity according to the weight of equipment. 10. Triangle foldable design, locking knob at the bottom for fast locking and unlocking.